Chief Financial Officer (CFO) Mike Ellis has given notice of his resignation from Mendocino Coast District Hospital effective May 10, 2019. 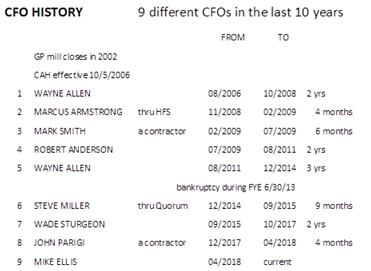 His departure marks the 9th CFO to exit MCDH in this position over the last 10 years, which may contribute to the financial challenges and struggles here. This chart illustrates the MCDH CFO history. Mr. Ellis gave 30 days notice, so his last day of employment is May 10, ironically the same date that the Affiliation Request For Proposals from other Healthcare Organizations is due. Not having access to a copy of his resignation letter and not able to contact him via telephone, we do not have any further details regarding his departure. This being the Mendocino Coast, there are many rumors floating around and Mendocino TV will share any accurate information gleaned on this matter as it comes in. Replacing the CFO annually is a shell game in terms of fiscal accountability. How much is the job worth? How does one apply? Are there any qualifications beyond the agreement to leave after 11 months?